The article summarizes a study conducted by George A. Bray, M.D., of the Pennington Biomedical Research Center in Baton Rouge, La., and his colleagues. The purpose of the study was to determine if the type of calories consumed (fat, protein, or carbohydrate) has any effect on what the body does with excess calories. Or more simply, do excess calories, regardless of type, increase body fat? In the study 25 participants between the ages of 18 to 35 with BMIs between 19 and 30 were divided into 3 groups. Each group was fed an excess of nearly 1,000 calories per day over the course of 56 days. Participants were also discouraged from exercising during the course of the study and monitored to make sure they ate all of the food they were given. “(When) the body was confronted with excess calories, but it didn’t care where they came from,” said Dr. Bray. 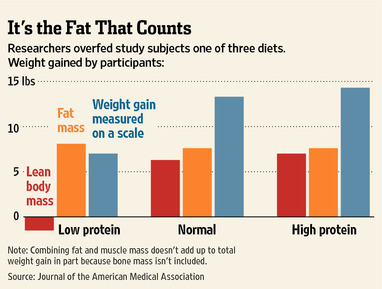 “The only thing it can do is put them into fat.” This outcome suggest that it matters little whether a diet is high or low in fat, carbohydrates or protein, it’s calories that cause a person to gain weight. It may be very tempting to assume that, in order to avoid excessive weight gain in the face of over indulgence, carbohydrates should be the food of choice. But, looking deeper at the outcomes of this study provides even more evidence for why we should throw away our scales and kick sugar to the curb!The first group ate a low-protein diet with 5% of their calories from protein. The second group ate a normal protein diet with 15% of their calories from protein. This group gets the distinction “normal” because the government recommends between 17% and 21% of your daily caloric intake should come from protein. And, the third group at a high protein diet with 25% of their calories coming from protein.As expected, over the course of the 56 days, in the face of an excess 1,000 calories per day, expectedly each of the participants gained weight. 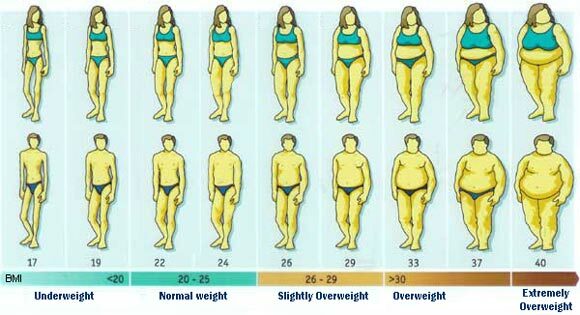 However, the amount of weight gained and the differences in weight gain between the 3 groups was surprising. The low protein diet group gained 6.97 pounds while the normal and high protein groups gained nearly double that amount – 13.3 pounds in the normal protein group and 14.4 pounds in the high protein group. As it turns out, the type of macronutrients you consume does mean something to your body. While it is true that excess calories in the diet do create body fat, not all calories are treated equally. Though each of the participants in the study gained weight on the scale, not all weight gained was body fat. In both the normal and high protein groups excess calories caused and increase of approximately 7 lbs of body fat. But that only accounts for half of the total weight gained. So, what makes up the other 7 lbs of body weight? Simple…lean muscle mass. Yup, that’s right. Even with out exercise, these individuals all put on nearly 7 lbs of metabolically active muscle. This increase in muscle mass significantly raises the resting energy expenditure – by more than 150 calories per day in both the normal and high protein groups. In an accompanying editorial, Zhaoping Li, M.D. and David Heber, of the Center for Human Nutrition at the David Geffen School of Medicine, University of California, Los Angeles, write that the results of this study informs primary care physicians and policy makers about the “need to understand the role of the Western diet in promoting overweight and obesity.” They suggested that “clinicians should consider assessing a patient’s overall fatness rather than simply measuring body weight or body mass index,” and urged clinicians to focus on “fat reduction rather than simply weight loss” in treating patients with obesity. You can read a summary of the original Journal of the American Medical Association (JAMA) publication here. So, do these findings give us carte blanche to over eat? Absolutely not. But, the outcome of this study does reiterate the importance of protein in the diet. When protein is lacking in the diet, the body will break down its own muscle tissue to meet its protein needs. However, when sufficient amounts of protein are present in the diet, the body will build muscle and become more metabolically active. This means you burn more calories every minute of every day just being your fabulous self. Include exercise – especially short, intense exercise like sprinting or jumping rope – and you are sending the message more muscle is necessary for your survival. The added protein in your diet provides the nutrition necessary to build this required muscle. Your end result? A firmer, younger, more metabolically active you! Worried about eating too much protein? Don’t…its hard to do. Protein provides great appetite control properties when you eat it. That is why over eating a large portion of protein is nearly impossible. A 16 oz rib eye steak, approximately 880 calories, would be tough for almost anyone to finish. Anyone who could would find the dessert menu less than appetizing. If you have ever been to a Brazilian barbecue and left it on green, you can attest to the extreme discomfort in consuming massive amounts of protein…something I affectionately call “the meat sweats”. Carbohydrates however have no such effect. I’m sure I am not alone when I say I could easily eat 12 Oreos. And, not only that but dinner a half hour later. Those dozen Oreos…nearly 1,000 calories of refined carbohydrates. So, what can we take away from this study and its findings? Protein is an essential nutrient. Adequate protein in the diet supports muscle retention and even muscle building in the absence of exercise. Inadequate protein consumption causes muscle wasting. When protein demands are not met through your diet, your body will metabolize its own muscle to meet its protein needs. Decreased muscle mass means a slower metabolism and a decreased caloric need. This does not mean your appetite decreases proportionately, however. The less muscle you have, and the more your appetite stays the same, the more likely you are to exceed your caloric need on a daily basis. This is exactly why the average American gains 1-2 lbs per year. That totals 20 lbs or more through the course of adulthood. It is much easier to exceed your caloric needs when you consume carbohydrates. Refined carbohydrates are calorie dense making it very easy to consume more than you require. Carbohydrates also have none of the appetite regulating properties of protein.